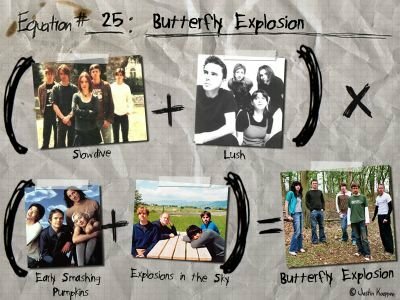 Anyone who knows me can attest to my love of shoegaze and of Anglo-oriented music, thus it's no surprise that I instantly took to Ireland's Butterfly Explosion. Though some would say they missed the shoegaze movement by about ten years, I would counter that shoegaze never died; it just never grew. It appeared in roughly the same size that it disappeared, with a few lingering echoes to carry the torch, such as Starflyer 59, Voyager One, Sianspheric, Pacific UV and now Butterfly Explosion. I wouldn't say there's a huge amount that makes Butterfly Explosion unique amongst it's predecessors, they follow the traditional vein of layered sound, subtle build to wall-of-sound climax, eerie synth, some prog guitar, droll vocals, etc. But the reason they're here being mathematically dismantled is, even though it's not really new, it's still damn good. See there's still demand for shoegaze and as long as bands like Butterfly Explosion keep the lucid, murky dream alive Anglophiles like me can still revel in the days when tapered black jeans, floppy hats guys with lipstick and lots of pewter necklaces was still kind of cool.